Norbert Neuser is a German politician who hails from the Social Democratic Party (SPD). 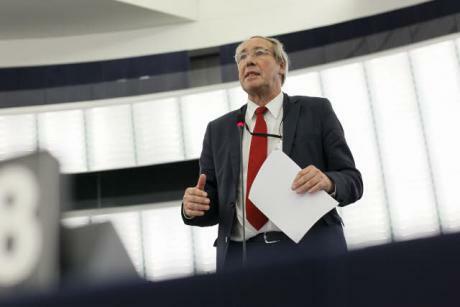 He was voted into the European Parliament in the 2009 and 2014 European Elections and serves on the institution’s Development Committee. He spoke with EURACTIV Germany’s Nicole Sagener. The Millennium Development Goal to cut worldwide poverty in half by 2015 has been reached ahead of time. But on education and health of mothers, the MDGs are falling through. What should be done to make better progress on these issues? Here, one must differentiate between individual countries. But a big problem is that the governments are not showing enough commitment in certain developing countries, regarding women’s and children’s health or education. Far too little is demanded of elites in India and sub-Saharan countries, for example. Here the EU must join with governments to set certain focus areas, which countries should invest more in. Rwanda is proof that this model works. There, active government work has achieved much in the way of helping the poorest among the population. Development cooperation must become fundamentally more effective. That does not mean every donor country has to be involved in every developing country. It would be more useful for the EU to determine certain sectors in which certain EU countries are particularly active. The German dual education system is sought after all over the world, for example. And Germany is also strong in the areas of health and infrastructure. That is what we want to concentrate on. Germany is lagging far behind on its own responsibility to increase spending on development cooperation to 0.7% of economic performance by 2015. In 2013, it was only at 0.38%. Why? The fact that Germany is not honoring its self-defined target as one of the richest industrialised countries is shocking to me. Many other countries like Sweden, Denmark, Luxembourg, the Netherlands and the United Kingdom are much further than 0.7%. But over the past few years, not a single German government has treated development policy as an important issue – except on catastrophes like natural disasters, Ebola or the current refugee crisis. We have not kept our promise. That eats away at our credibility – also with regard to the upcoming climate negotiations during the G7 Summit at Schloss Elmau and the Climate Conference COP21 in Paris in December. Why should other states believe that we will achieve climate targets if we do not fulfill the development goals? In a recent resolution, MEPs call on member states to honor the 0.7% goal and develop timetables to reach this target by 2020. How optimistic are you that these can still be reached? Unfortunately, reaching the 0.7% target by 2020 is not politically desired in Germany. Unless something sensational happens. Germany has a well-informed, well-positioned civil society that must make the targets an issue present in the public sphere. The latest decision from the European Parliament also “stressed the need to mobilise domestic resources efficiently in developing countries as a key source of financing”. What could incentives look like here? The focus should be on helping to build good structures in the tax, healthcare and economic sectors. Among other things, the private sector and small businesses – especially young people and women in this category – should be supported. In the long-term, this can even save money. Take the Ebola crisis as an example. This huge catastrophe and many expenditures related to it could have been avoided if we had invested in a better healthcare system in the countries affected. At the Petersburg Climate Talks, German Chancellor Merkel announced that Germany would double its development aid funding for climate protection by 2020 compared to 2014. Should we expect this commitment to come at the cost of other development projects? I fear that this actually only means funds will be rearranged. These are old tricks, in the EU as well. We need more resources instead of rearrangement. Here, members of the Bundestag must exercise more pressure. According to the latest data report from the organisation ONE, the overall scope of Official Development Assistance (ODA) that goes to the 48 least developed countries (LDCs) is alarming. In 2014, overall ODA for LDCs decreased by 6% compared to 2010. Should the international community set new targets here? Official EU policy actually promises more money for the least developed countries. But at the same time there is repeated opposition from middle income countries. Many countries of this kind are still strongly supported. Former colonial states like Spain still support their former colonies in Latin America, for instance. In your opinion, what is important to tackle in order to fight poverty in the LDC states? A significant problem in many LDC countries like Congo or Nigeria is the distribution of money. These states are actually rich in raw materials but nothing reaches the poorest of the poor. Still, donor countries are often dominated by the helper-mentality that does not actually focus on the basis of the problems. Top priorities should be building and promoting stable structures, such as in tax legislation, better governance and in the healthcare system.